In conjunction with its new exhibition, Descansos: Love, Grief, and Faith, the Branigan Cultural Center is hosting a series of three collage workshops on successive Saturdays in November: 9, 16 and 23 at 1 pm. The programs are free and open to the public. 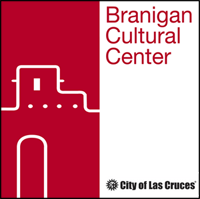 Please register in person at the Branigan Cultural Center, or by calling 575-541-2154. Registration deadlines are the Thursday before each workshop. Workshops will be led by local artist Dr. Ann Bowie Maxwell and will link the images in the exhibit with the ideas of place, memory, and personal and community myths. Descansos are spontaneously created personalized shrines that memorialize both the life of the one we have lost and our love for that person. Descansos make our loss visible both to those who knew the person and to those who never met him or her. Representing a place of departure, Descansos also give us a place to return. They stand as witness and as a sentinel in a sacred location. The three workshops are interrelated but independent, offering participants the choice of either creating a small work of art at a single workshop or coming to all three workshops and building a larger three-dimensional collage. Each workshop will include a discussion of a key aspect of memory, myth, and creation, followed by time working on a personal collage. Maxwell will bring examples of her own work, as well, to help inspire participants’ creativity.